Quickly access your SMS database via Aelita’s SnapReports. Anyone working with Microsoft’s Systems Management Server knows that one of its greatest strengths is its vast information database concerning a network’s systems. But getting useful information from that database isn’t always an easy task. Many organizations find they need a third-party solution to extract that data. This usually means learning to operate a new external program and, sometimes, even dedicated hardware. SnapReports, however, is unique — it’s not an external application. Rather, SnapReports “gently” attaches itself to the SMS Administrator Console, allowing administrators to easily and quickly create customizable HTML reports drawn from the SMS database. With SnapReports operating as part of the SMS Administrator Console, the learning curve is reduced. In no time, administrators — who already know the SMS Console — can be using SnapReports. 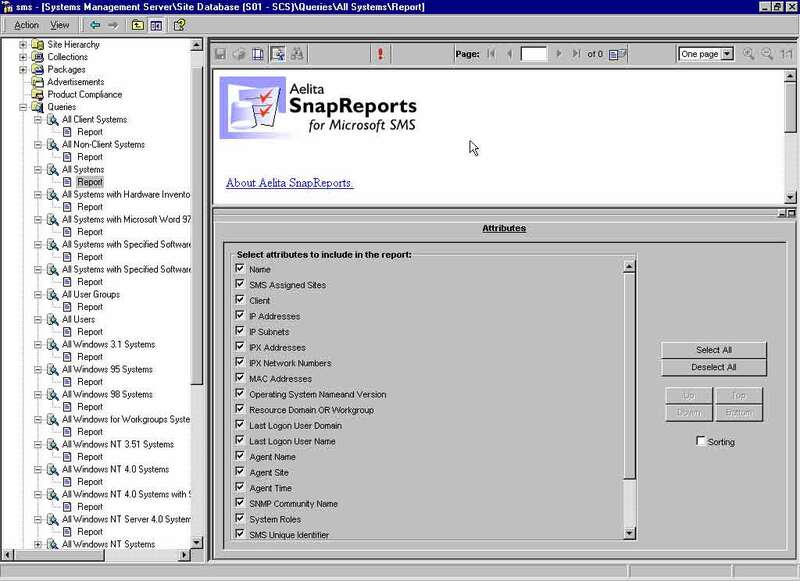 What’s more, installing SnapReports doesn’t modify any SMS-generated reports. SnapReports simply appears as a Report extension under the Queries and Status Messages Queries sections of the Administrator Console. A really cool SnapReports feature is its one-touch operation. Almost everything that needs to be done can be performed with a single mouse click. There’s no need for extra dialog boxes or searching for the correct field in the hierarchy. 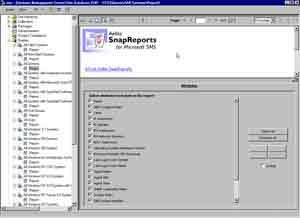 Creating reports with SnapReports is easy. Simply select the SMS Query or SMS Collection you want to build a report around, choose the attached Report, select the attributes to display and any necessary parameters, click the Run button, and the report is generated. SnapReports also remembers your input so the next time you choose this report, the previous information will be automatically selected for you. Once a report is created, you can search it by clicking the Find button and entering the search criteria. Customizing reports is just as easy. Because all reports are generated as HTML, all you have to do is modify the template. With basic knowledge of HTML, your reports can quickly display your company’s logo or colors. I did run into one drawback while using SnapReports: It requires Internet Explorer 5.0 for report display. The program’s setup process didn’t check to see if I had IE5 installed. What’s more, not only did I need to reboot my server after installing SnapReports, but after installing IE5. This procedure could impact any organization running the SMS Administrator Console on an SMS server — many organizations wouldn’t agree to reboot a production server twice. I should also note that the SnapReports version I tested failed to display when IE5.5 was installed. Other than these minor drawbacks, SnapReports is a solid tool — extremely powerful and easy to use. If your organization requires advanced and customized reports drawn from your SMS database, this is definitely a solution that you should consider.